Get ready for more microsaur mayhem (and a bit of babysitting!) 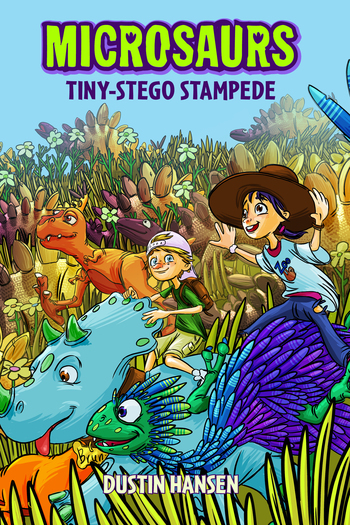 in Tiny-Stego Stampede, the fourth installment of Dustin Hansen's action-packed illustrated chapter book series! “How do you hide a herd of stegosaurus?” Lin asked. She picked a long strand of grass, then started chewing on it as we sat in the big open field. Dustin Hansen, author of Game On! and the Microsaurs series, was raised in rural Utah where he spent many days hiking red rock canyons that once belonged to the dinosaurs. After studying art at Snow College, Dustin began working in the video game industry, where he has been following his passions of art and writing for more than 20 years. When not writing or making video games, Dustin can often be found hiking with his family in the same canyons he grew up in, with a sketchbook in his pocket, a new idea in his mind, and a well-stocked backpack over his shoulders.